Eight years ago today I became a mommy! It seems like a lifetime ago. I remember heading to the hospital, freaking out that the time had really come. I was about to meet my baby for the first time. “It” was going to be either Samuel David or Adelina Mae. I secretly hoped to have a girl. 🙂 I knew I would be happy either way, but I longed for a girl. When they announced “It’s a girl!” My life was changed forever. I love all my kids deeply. Of course I do! But I’m telling you, there is just something special about my firstborn. She’s my treasure, my guinea pig (so sorry Addie! ), my little sidekick, my mini-me. She’s the most like me of all my kiddos. Sometimes that works against us, but most of the time it’s wonderful. We “get” each other. So, today my Adelina Mae turns 8 years old!! 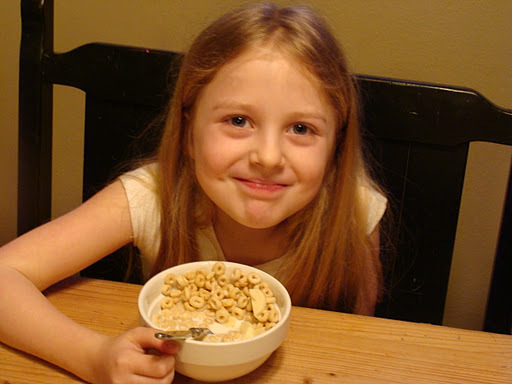 Cheerios- special birthday breakfast request. Why yes, she is very easy to please!! For her birthday Addie has 3 wishes. Wish #1- for her and Havalah (3 yr old little sis) to go together to get their ears pierced. Granted! We’re off to the mall as soon as it opens. Wish me luck!!! Wish #2- a sleepover. Granted. Little friends heading over this evening for giggles and pillow fights. Wish #3- Now this is where it gets tricky. In order for this wish to be granted I’ll need a little help from my friends. YOU! Addie would love love love to see this little one’s grant grow! “Kelsey is a sweet baby girl with Down syndrome. She does have a heart condition but her medical records indicate she should not need surgery. Kelsey knows her caregivers, smiles at them and plays with toys. Today Addie is being celebrated by family and friends. Would you join with our celebration by giving to Kelsey’s grant today? Any money you donate will go directly to a fund that will help get Kelsey home once she is chosen by an adoptive family. Adoption is a HUGE expense, so if these kiddos have money in their grant it takes some of the burden off of the family that goes to rescue them. If you would like to donate to Kelsey’s fund go here. No amount is too small! Every drop helps fill the bucket. Even if you can’t give money, you can still help. Share this with your friends! What if someone you share this with is meant to be Kelsey’s mommy or daddy?? What if? Now that would be the ultimate birthday wish come true! Happy Birthday my sweet Adelina. I love you more than pickle-berry pie. Thank you Jane!! You rock.